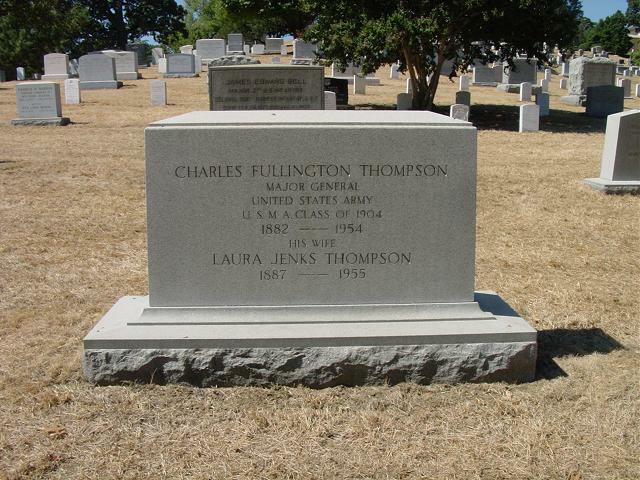 Charles Fullington Thompson, born in Jamestown, North Dakota, on 11 December 1882. He was the son of John Justin Thompson and Ida May Fullington. He graduated from the US Military Academy in 1904 and eventually became a Major General in the United States Army. WASHINGTON, June 18, 1954 – President Eisenhower attended a funeral service at Arlington National Cemetery today for one of his former commanding officers, Major General Charles F. Thompson, who died Tuesday at the age of 71. The President was accompanied by Mrs. Eisenhower at the graveside ceremony. General Eisenhower served as Chief of Staff under General Thompson when the latter commanded the Army’s Third Division at Fort Lewis, Washington, in 1940-41. The division moved in 1941 to Couth Carolina for maneuvers that first brought the President to prominence. H was a Lieutenant Colonel at that time. At today’s service, General and Mrs. Eisenhower expressed their sympathy to General Thompson’s widow. General Thompson, a native of North Dakota, was graduated from West Point in 1904. During World War I he served with the First Army Intelligence Unit and later in the same capacity with the Second Army. In 1921 he was Chief of Press Relations for Military Intelligence. He was commanding general of the Military District of Washington in 1944-45, and then retired from the Army. He had made his home in Washington. One of General Thompson’s appointments during World War I was adjutant of the Eighty-Second Division. He participated in the St. Mihiel offensive. He won the Distinguished Service Medal and the Medal of the French Legion of Honor. On August 11, 1941, General Thompson was assigned to command of the First Army Corps at Columbia, South Carolina. In the subsequent maneuvers he commanded that Corps in exercised against the Second Corps. The maneuvers lasted until the end of November.